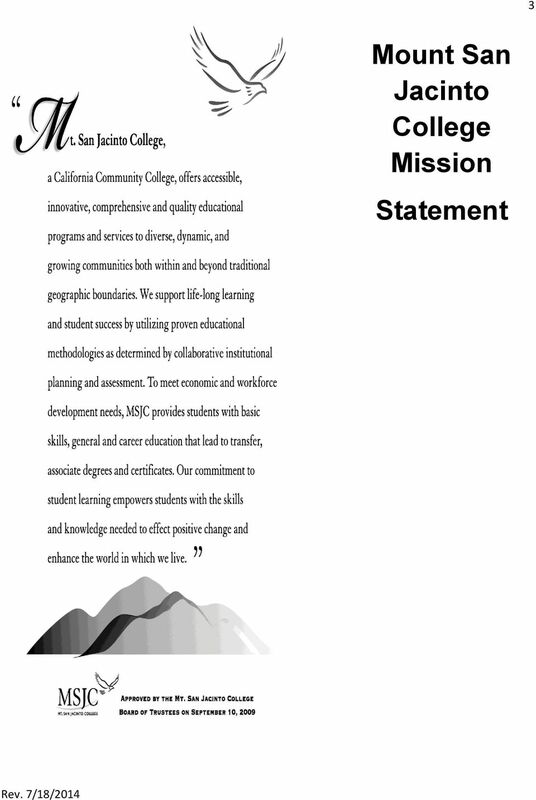 Download "Mount San Jacinto College Associate Degree Nursing Program"
4 4 Associate Degree Nursing Program Mission Statement The Mission of the Associate Degree Nursing Program is to prepare entry level registered nurses to function effectively within nursing and inter-professional teams. These graduates will deliver evidence based patient centered care to culturally diverse populations across the life span in a variety of healthcare settings. Graduates will be effective communicators and demonstrate a commitment to lifelong learning utilizing informatics resources. We respect the individuality of students and recognize that each student has different learning styles, diverse backgrounds, and unique support systems. The goal of the program is to promote student success in a positive, innovative learning environment that promotes continuous quality improvement, empowers students to develop critical thinking skills, professional attitudes to ensure safe practice, clinical reasoning, and decision making that result in positive patient outcomes. 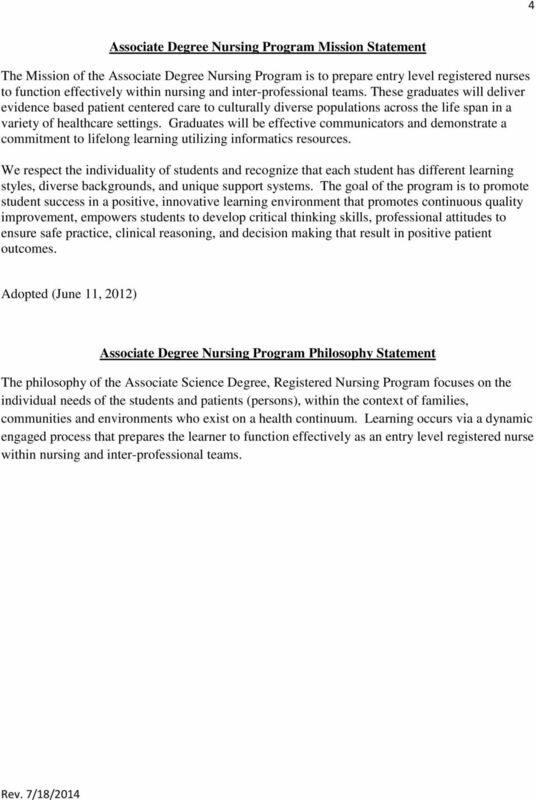 Adopted (June 11, 2012) Associate Degree Nursing Program Philosophy Statement The philosophy of the Associate Science Degree, Registered Nursing Program focuses on the individual needs of the students and patients (persons), within the context of families, communities and environments who exist on a health continuum. Learning occurs via a dynamic engaged process that prepares the learner to function effectively as an entry level registered nurse within nursing and inter-professional teams. 6 6 Introduction Healthcare today has placed increased demands on the profession of nursing more than ever before. Entry-level practice for new graduates requires complex clinical skills, along with the ability to critically think to ensure the transition into practice and safe patient outcomes. In order to meet the requirements of the entry level nursing graduate and the needs of healthcare facilities, Mt. 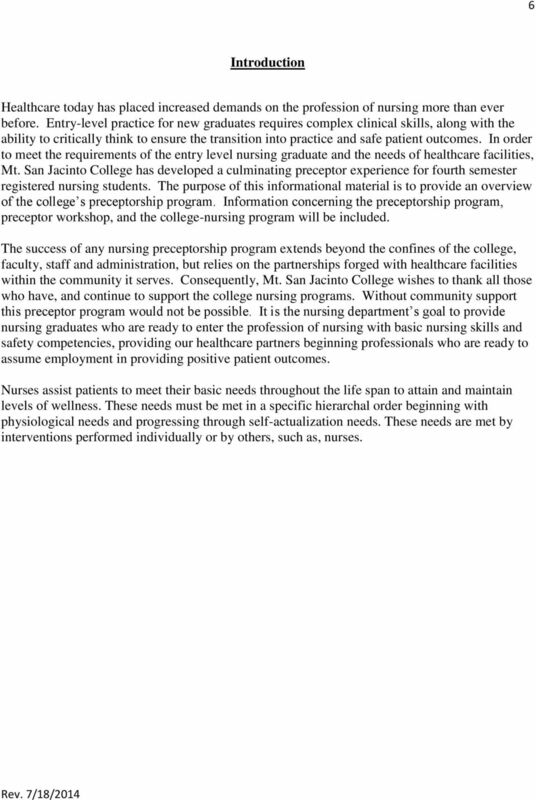 San Jacinto College has developed a culminating preceptor experience for fourth semester registered nursing students. The purpose of this informational material is to provide an overview of the college s preceptorship program. Information concerning the preceptorship program, preceptor workshop, and the college-nursing program will be included. The success of any nursing preceptorship program extends beyond the confines of the college, faculty, staff and administration, but relies on the partnerships forged with healthcare facilities within the community it serves. Consequently, Mt. San Jacinto College wishes to thank all those who have, and continue to support the college nursing programs. Without community support this preceptor program would not be possible. It is the nursing department s goal to provide nursing graduates who are ready to enter the profession of nursing with basic nursing skills and safety competencies, providing our healthcare partners beginning professionals who are ready to assume employment in providing positive patient outcomes. Nurses assist patients to meet their basic needs throughout the life span to attain and maintain levels of wellness. These needs must be met in a specific hierarchal order beginning with physiological needs and progressing through self-actualization needs. 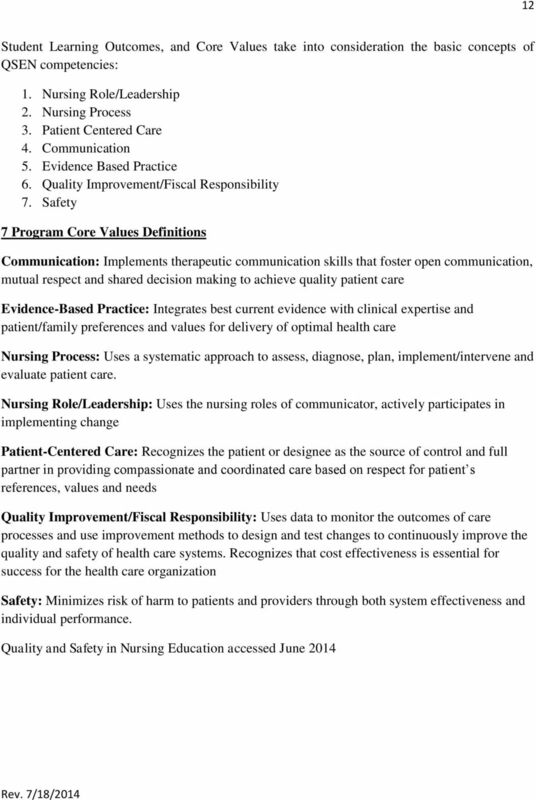 These needs are met by interventions performed individually or by others, such as, nurses. 8 8 ROLES OF PRECEPTORSHIP PRECEPTOR ROLE PRECEPTOR, PRECEPTEE, PROGRAM COORDINATOR, AND FACULTY LIAISON 1. Participates in on-line preceptor orientation and completes evaluation 2. Acts as a role-model, educator, and facilitator 3. Willing to explore new teaching and learning techniques to ensure preceptee meets objectives 4. Fills out BRN information sheet and Preceptorship Agreement form. 5. Shares work schedule with preceptee. 6. Reviews preceptor packet with preceptee. 7. Assists faculty liaison in arranging a substitute or back up preceptor as needed. 8. 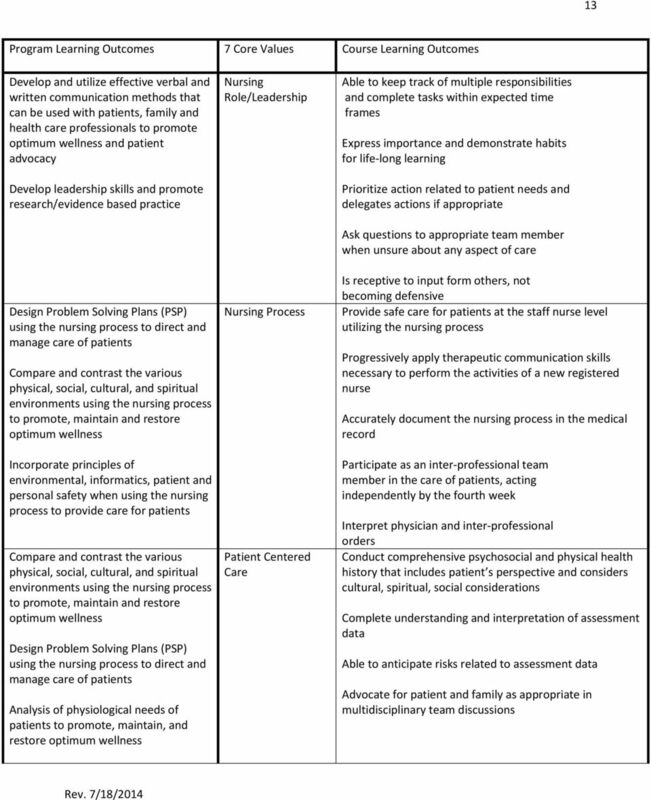 Discusses preceptee s weekly objectives and guides his/her learning through selection of increasingly complex duties in order to meet nursing objectives. 9. Supervises and teaches the preceptee in the clinical area 10. Facilitates socialization of the preceptee into the inter-professional role through teamwork collaboration 11. Confers with the faculty liaison on the preceptee s progress in meeting clinical objectives. 12. Utilizes faculty liaison for consultation as needed or desired. 13. 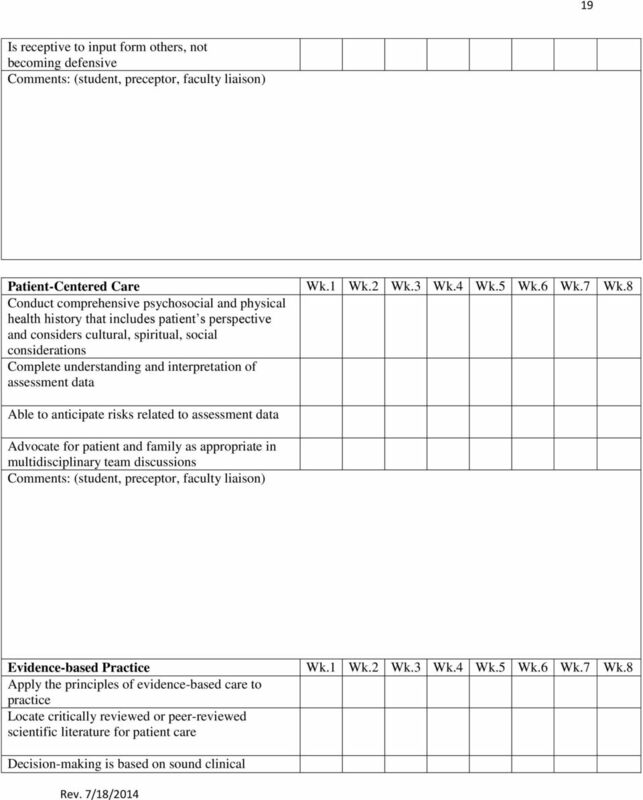 Gives the preceptee daily constructive feedback and documents preceptee s ability to meet clinical objectives on the Clinical Objectives/Preceptorship evaluation form. 14. Recognizes that when a conflict between students or patients in the clinical unit occurs, the goal is for patients and students to be able to peacefully coexist. Please contact clinical faculty if a conflict should occur. 15. Please notify clinical faculty whenever a concern over student performance exists. The sooner the faculty is alerted to a potential problem the sooner the faculty will be able to intervene in order to try to remediate the student and facilitate their successful completion of the course. PRECEPTEE ROLE 1. Requests desired unit according to instructions by clinical instructor. 2. Reviews preceptor packet with assigned preceptor prior to the first day of preceptorship. 3. Works hours to complete preceptorship based on selected preceptorship option. BACK-TO-BACK DAYS ARE EXPECTED UNLESS ALTERNATE SCHEDULE APPROVED BY FACULTY LIAISON. 4. Students are expected to work a minimum of 1 day per week over a minimum of 5 weeks faculty liaison must approve exceptions. 5. 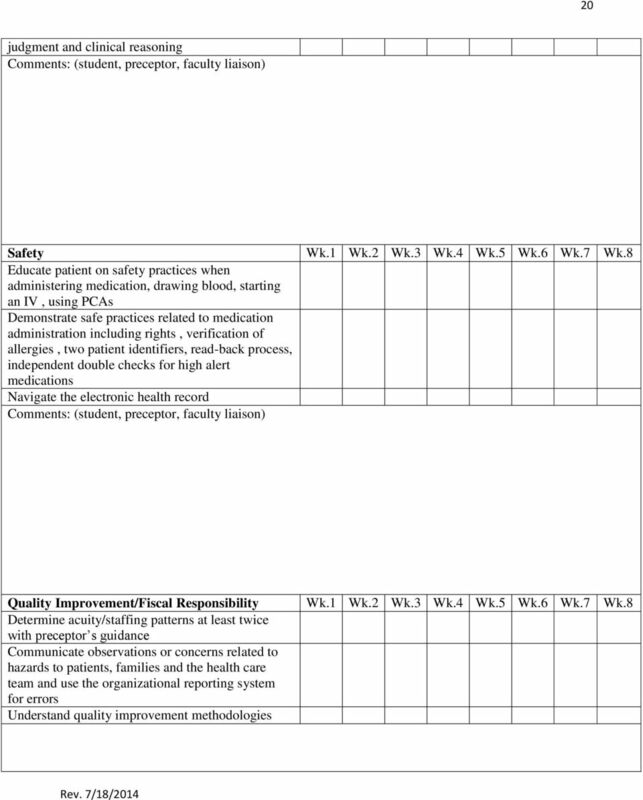 Develops clinical schedule based on preceptor s workdays. Schedule MUST be given to faculty liaison prior to clinical days. Days WILL NOT be counted if faculty liaison is not notified in advance of working day. 9 9 6. Works under the supervision of the preceptor or their designee, and is able to appropriately use other personnel in the setting for supervision or consultation. 7. 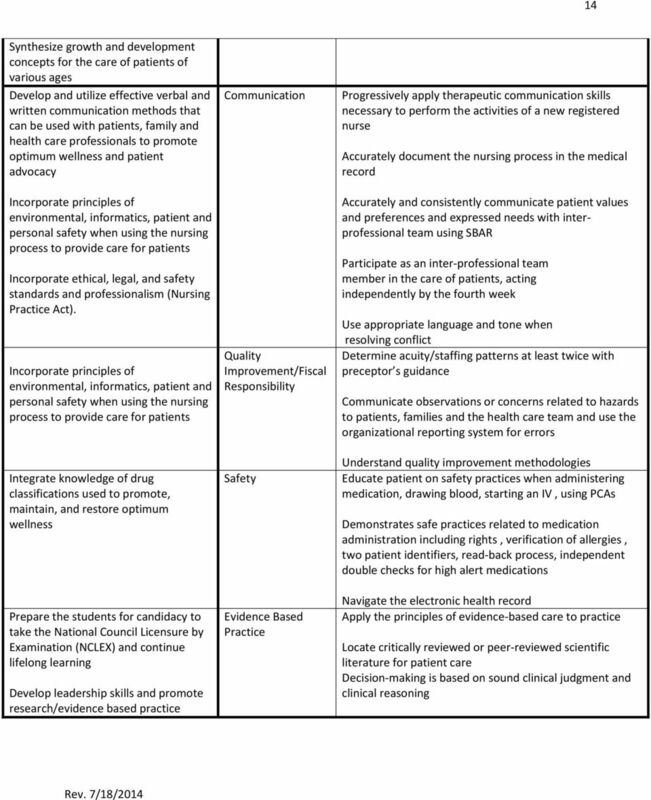 Reviews the Clinical Objectives/Preceptorship Evaluation form prior to preceptorship and works with the preceptor throughout the rotation to identify learning needs and to seek out opportunities to meet the majority of clinical objectives, as experiences are available. 8. Completes or contributes to and implements a minimum of one patient care plan using individual unit s format. 9. Achieves objectives jointly determined by the preceptee/preceptor and faculty liaison at a satisfactory level. 10. Contacts preceptor and faculty liaison in advance for absences and/or changes in schedule. 11. Completes the terminal objectives and provides a copy to the preceptor and clinical faculty within the expected time frame. 12. Completes the critical thinking log after each preceptorship day. PROGRAM COORDINATOR ROLE 1. Coordinates the faculty selection of preceptors. 2. Is available by phone and/or Contacts all preceptors to assess their needs before the start of the preceptorship experience. 4. 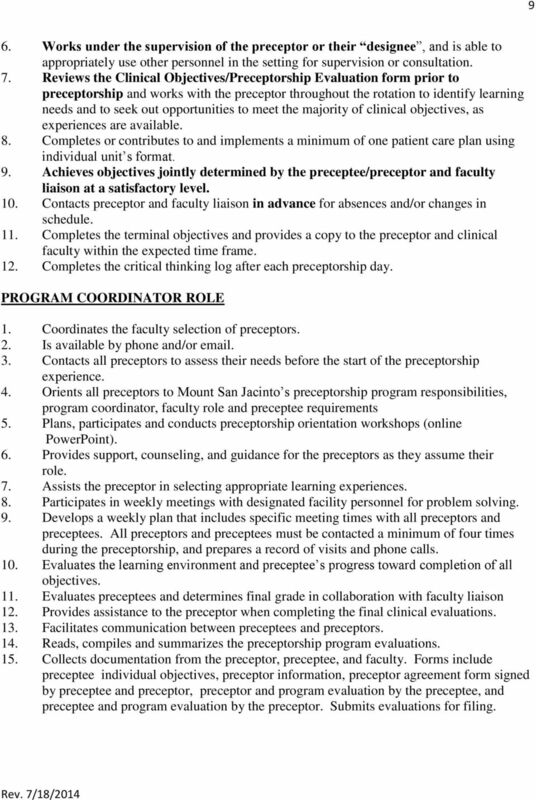 Orients all preceptors to Mount San Jacinto s preceptorship program responsibilities, program coordinator, faculty role and preceptee requirements 5. Plans, participates and conducts preceptorship orientation workshops (online PowerPoint). 6. 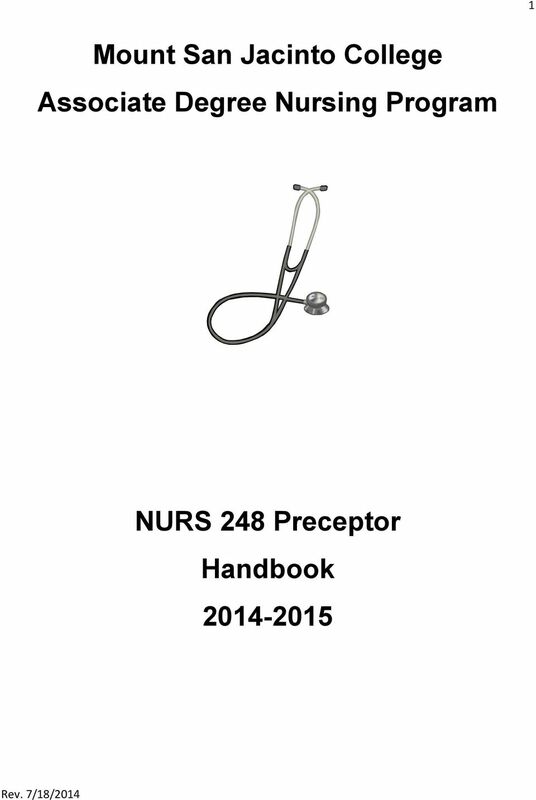 Provides support, counseling, and guidance for the preceptors as they assume their role. 7. Assists the preceptor in selecting appropriate learning experiences. 8. Participates in weekly meetings with designated facility personnel for problem solving. 9. Develops a weekly plan that includes specific meeting times with all preceptors and preceptees. 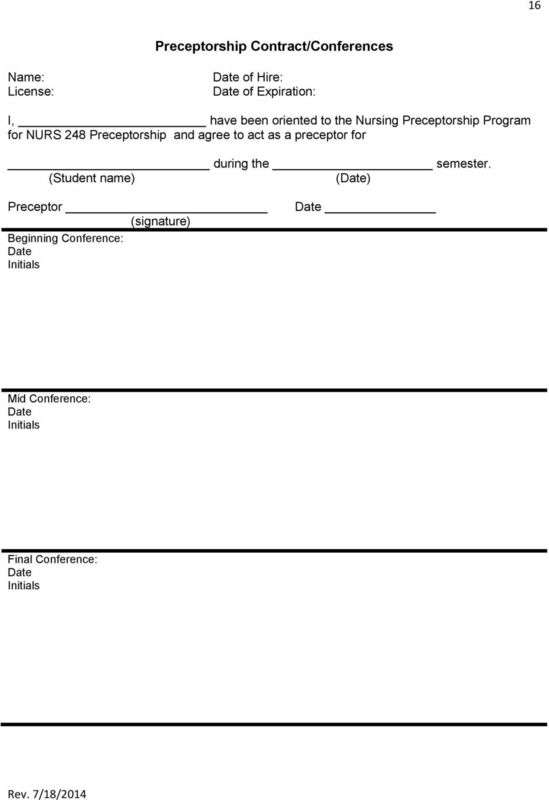 All preceptors and preceptees must be contacted a minimum of four times during the preceptorship, and prepares a record of visits and phone calls. 10. Evaluates the learning environment and preceptee s progress toward completion of all objectives. 11. 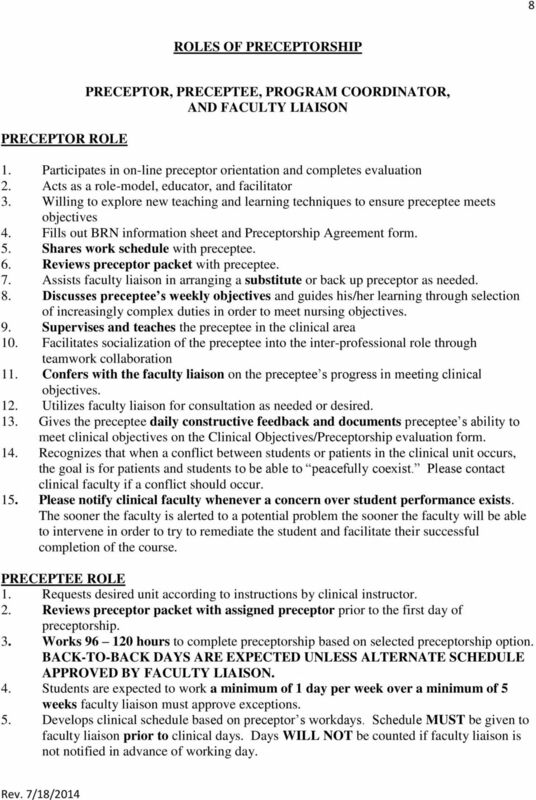 Evaluates preceptees and determines final grade in collaboration with faculty liaison 12. Provides assistance to the preceptor when completing the final clinical evaluations. 13. 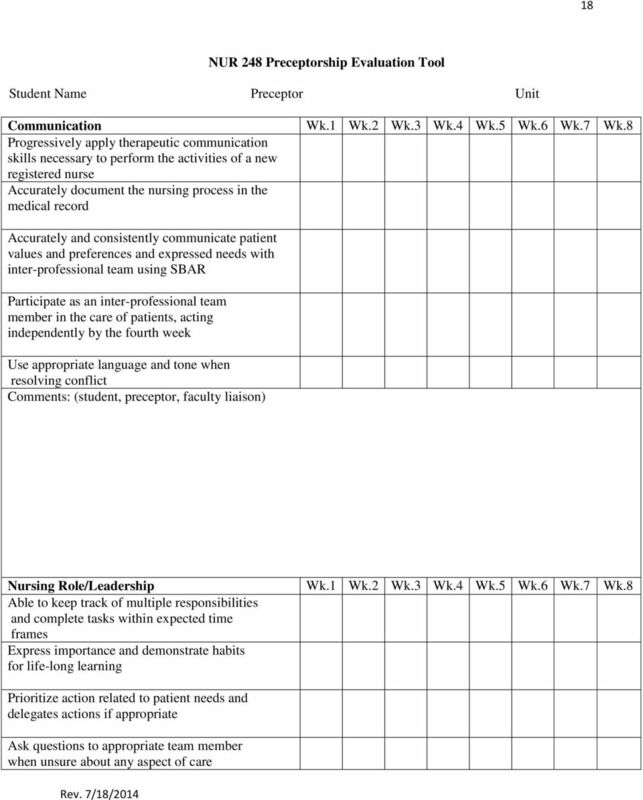 Facilitates communication between preceptees and preceptors. 14. 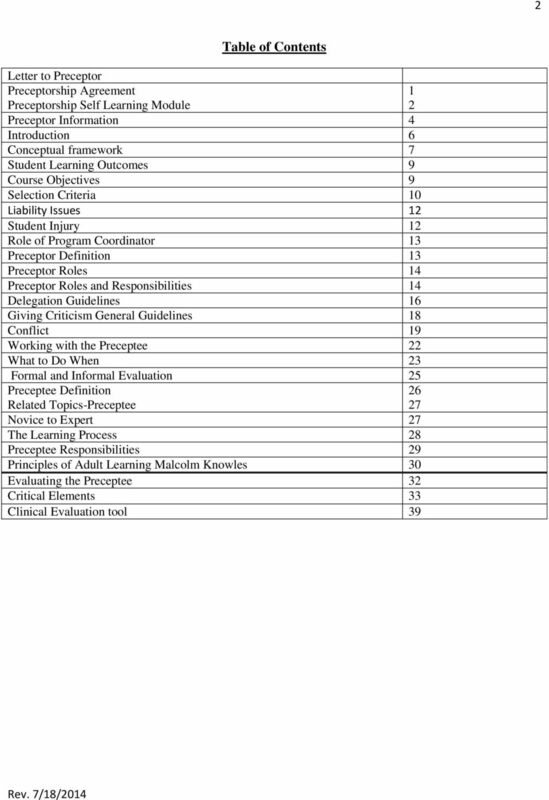 Reads, compiles and summarizes the preceptorship program evaluations. 15. 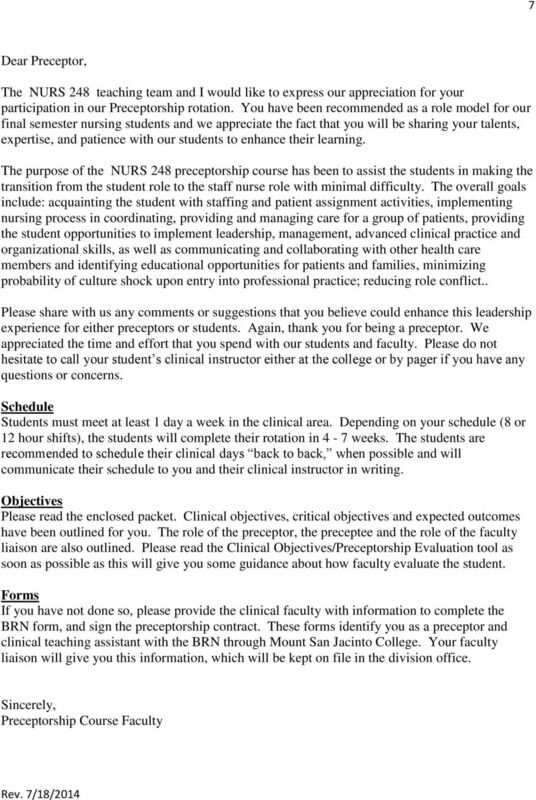 Collects documentation from the preceptor, preceptee, and faculty. 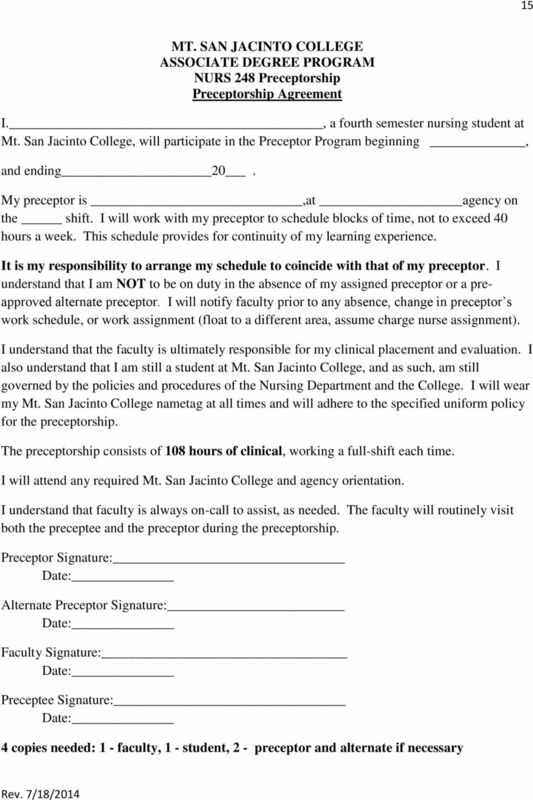 Forms include preceptee individual objectives, preceptor information, preceptor agreement form signed by preceptee and preceptor, preceptor and program evaluation by the preceptee, and preceptee and program evaluation by the preceptor. Submits evaluations for filing. 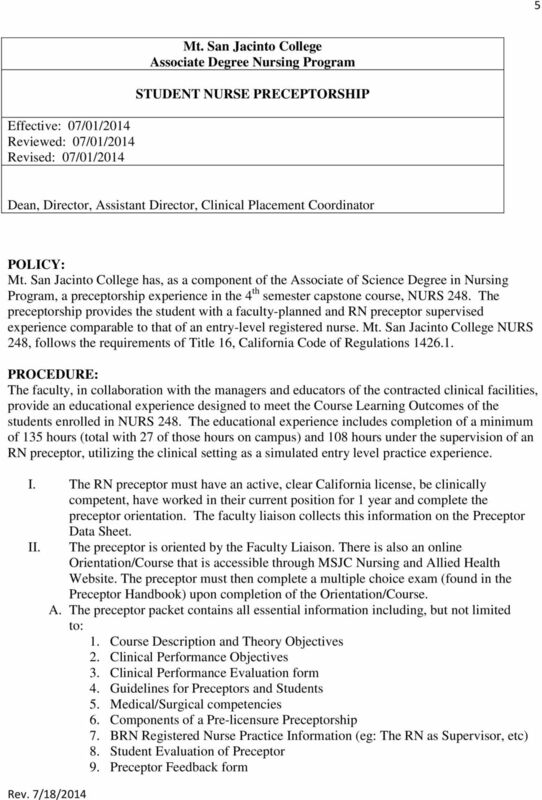 17 17 Preceptor Resume/CV Name: RN License: Exp. 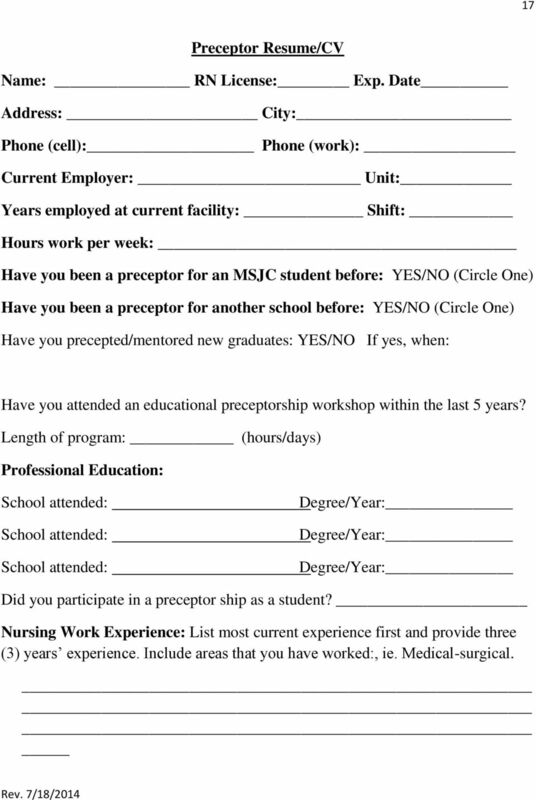 Date Address: City: Phone (cell): Phone (work): Current Employer: Unit: Years employed at current facility: Shift: Hours work per week: Have you been a preceptor for an MSJC student before: YES/NO (Circle One) Have you been a preceptor for another school before: YES/NO (Circle One) Have you precepted/mentored new graduates: YES/NO If yes, when: Have you attended an educational preceptorship workshop within the last 5 years? Length of program: (hours/days) Professional Education: School attended: School attended: School attended: Degree/Year: Degree/Year: Degree/Year: Did you participate in a preceptor ship as a student? Nursing Work Experience: List most current experience first and provide three (3) years experience. Include areas that you have worked:, ie. Medical-surgical. 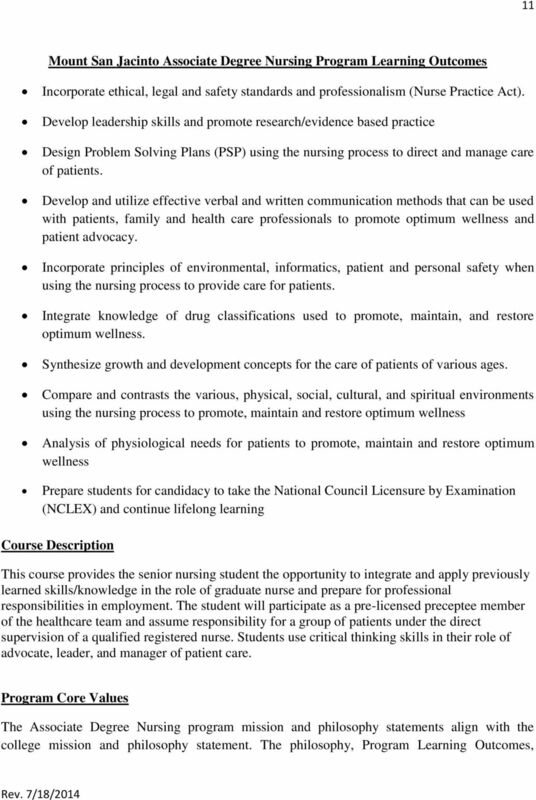 SAN JUAN COLLEGE DEPARTMENT OF NURSING NURS 130 Nursing Concepts and Practice II (5+9p) 8 Cr.